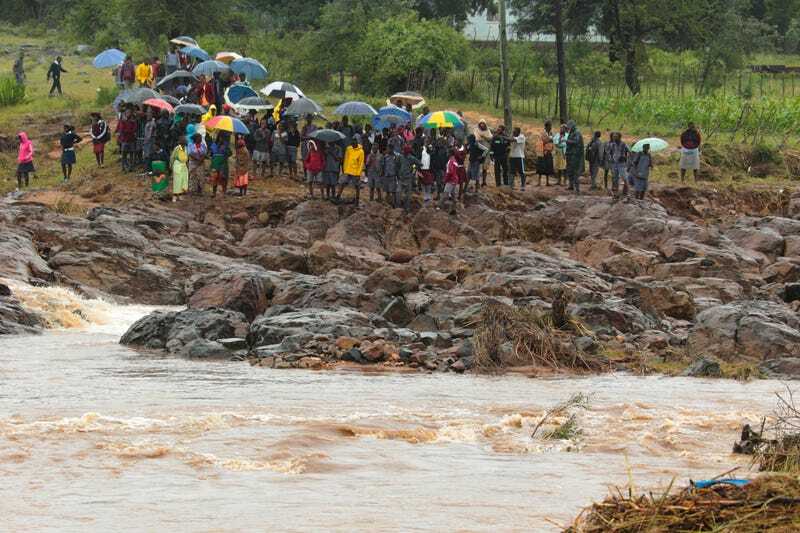 Schoolchildren are stranded across a collapsed bridge in Chimanimani, southeast of Harare, Zimbabwe, Monday, March 18, 2019. PBS reports that in a national radio address on Monday, Mozambique’s President Filipe Nyusi announced that more than 1,000 people may have been killed by Cyclone Idai—which by early estimates is the worst in more than 20 years. “Officially, we have a record of more than 84 dead but everything indicates that we can have a record of more than 1,000 dead,” Nyusi said, adding that more than 100,000 citizens remain in danger. According to CNN, Cyclone Idai made landfall near Beira—a coastal city of 500,000—around midnight Thursday before making its way through neighboring Zimbabwe and parts of Malawi. The International Federation of Red Cross and Red Crescent Societies (IFRC) suggested that there are more than 215 confirmed deaths in Zimbabwe, Malawi and Mozambique, while more than 1.5 million have been affected and hundreds more remain missing. Additionally, they warned that the death toll could jump considerably. Mozambique’s President Filipe Nyusi and Zimbabwean President Emmerson Mnangagwa both cut foreign trips short in order to return home and tend to the emergencies created by the storm. President Emmerson specifically wanted to ensure that he is “involved directly with the national response by way of relief to victims of Cyclone Idai,” according to the information ministry, as the Zimbabwean government declared a state of national disaster. In response to the cyclone, rescue efforts from U.N. agencies and the Red Cross are underway, including the delivery of medicines and food supplies to those in need. Additionally, a GoFundMe campaign has been organized by Freeman Chari to supply those affected by the storm with tents, blankets, and non-perishable foods.